Martin Luther King beautifully articulated a core union value when he said, “injustice anywhere is a threat to justice everywhere”. I believe the injustices in aged care wrong us all, both as health professionals and health consumers. And I think we must be more vocal in opposing the chronic undervaluing of both our elderly and those who care for them. Everyone grows older. And everyone has family members who have grown older. So why are older New Zealanders in care treated like second-class citizens? And why are those who do the caring work paid poverty wages? In a sector where a quarter of workers are on the minimum wage, why do the managers get “megabucks”, as reported in the news last week? Why does the managing director of Ryman Healthcare get $839,249 a year? Why is the chief executive of Metlifecare on $811,040? In our hearts, we know why wages are low. The carers are predominantly women, who are traditionally undervalued in our society. And union density (the proportion of staff in a union) in the aged care sector has been too low to command the bargaining power needed to really change that. And we know why the retirement bosses get megabucks. Aged care has been largely privatised and corporatised in New Zealand, so that 77% of our aged care beds are now provided by private or corporate operators. They are making huge profits. Ryman, for instance, has reported twelve consecutive years of record profit, and increased its wealth from $135 million to over $4.0 billion in the last 15 years. The job of corporate CEOs is to deliver a return to investors, and when they do it on this scale, they are richly rewarded. But why then does our government, which pleads poverty when it comes to nurses’ pay negotiations, give Ryman over $800 million worth of taxpayers’ money every year? The Fair Share for Aged Care campaign was jointly launched by NZNO and the Service & Food Workers Union Ngā Ringa Tota in 2004. 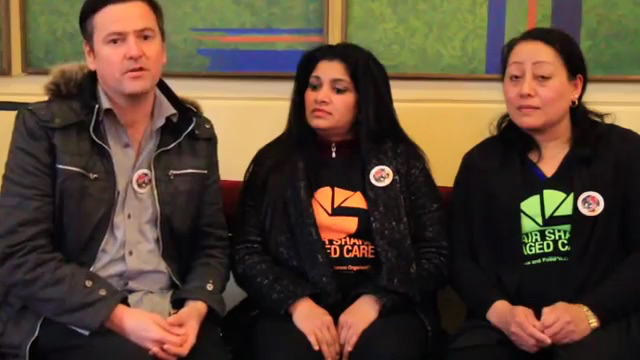 It aimed to increase union membership and collective bargaining in order to raise pay and the quality of care in the aged care sector, and spawned the Fair Share News. Through determined effort – including industrial action – the campaign has won improvements (or limited the deterioration) for workers and residents in some aged care facilities. 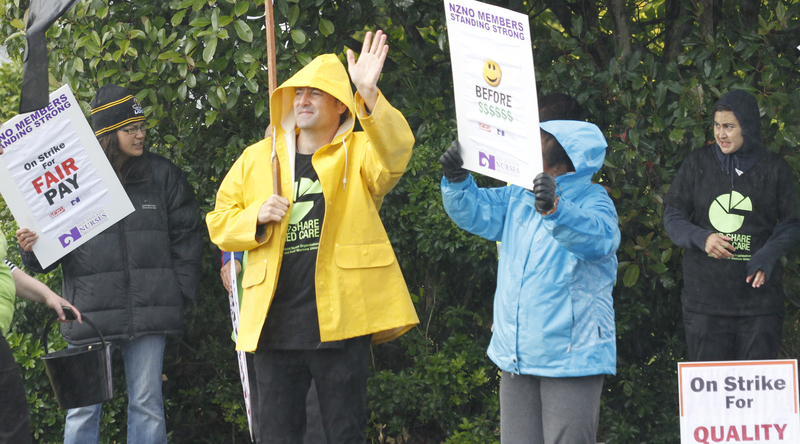 Supporting a Fair Share for Aged Care, rain or shine – on the picket line with striking Oceania workers, March 2012. The Fair Share campaign has also taken the issues into the political arena. 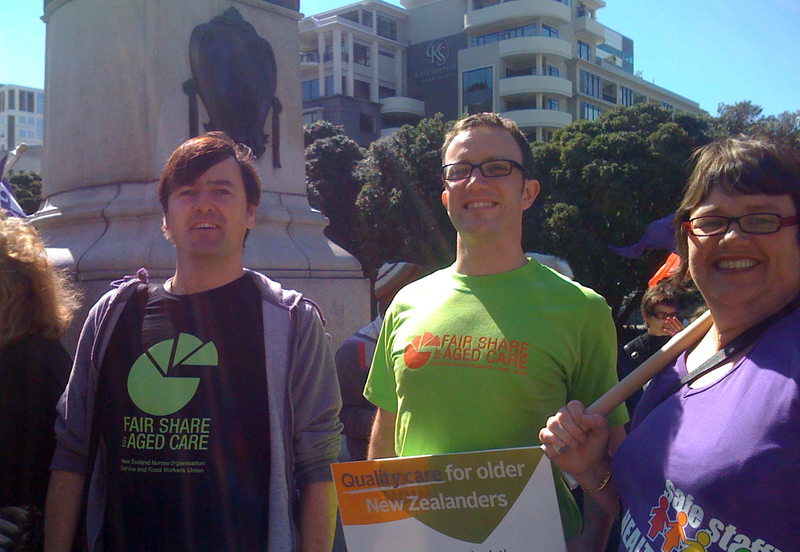 In 2011, Fair Share campaigners presented over 11,000 signatures in support of the Aged Care Charter to Parliament. The Charter made four simple recommendations, each of which would have made a huge difference: Compulsory safe staffing levels and skill mix, fair pay and conditions, a nationally recognised training programme for all aged care staff and a guarantee that government funding is only used for care of residents. Why did the government, which claims to represent all New Zealanders, reject all four recommendations? And why did it also reject the recommendations of the Human Rights Commission the following year, when they released their Caring Counts report? Especially given the comment by EEO Commissioner Dr Judy McGregor that, “In my time as Equal Employment Opportunities Commissioner there has seldom been the degree of unanimity about a work-related issue than there is about the low pay of carers”? But despite the government’s snub, the Caring Counts report did give rise to a tripartite Summit, which I attended last year and wrote about on the NZNO Blog, to keep up the pressure for change. Conveying solidarity on behalf of NZNO’s DHB National Delegates Committee, at the Caring Counts Summit last year. The hard truth is that in 2015 we still have a long, long way to go. To reach our destination, I believe that NZNO leaders must raise the volume in their opposition to the injustices in aged care. I’d like to see NZNO leadership be as vocal as the Service & Food Workers Union were in the news story above, about retirement bosses’ pay. Because ultimately, why we are mistreated matters less than how we respond. In the 2013 local elections, when I stood as the NZNO-endorsed candidate for Capital & Coast District Health, my number one priority was, “Putting the care back into aged care“. As NZNO President, I will be just as vocal in demanding we deliver dignity for older people and a fair share for Aged Care staff. No-one denies that Aged Care is neglected. It’s the poor relation in the health system. Yet we, with our 46,000 voices, have the power to challenge and ultimately change that injustice. I pledge to use my voice loudly against this injustice. Will you join me?